"If you are pro-life and a Students Union president, you will have a hard time in Ireland. Where is freedom of speech?” asks Bishop Phonsie Cullinan. The plight of the former UCD Student Union president, Katie Ascough, who was impeached for upholding the law on the publication of abortion information, has been cited by the Bishop of Waterford & Lismore as demonstrating the lack of freedom of speech in Ireland. 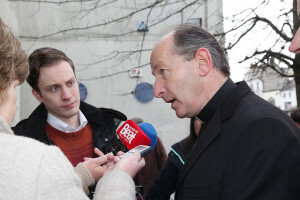 In his opening address to the conference ‘Crisis of Democracy in Ireland’ in Waterford on Tuesday, Bishop Phonsie Cullinan described the impeached student leader as “unashamedly pro-life”. The referendum last Thursday night showed a clear majority of the 6,600 students voted in favour of removing the pro-life supporter. She said universities should be a place of freedom of speech, of thought, and of association. Elsewhere in his address at the Theatre Royal in Waterford, the bishop warned that the deletion or amendment of Article 40.3.3 would serve no purpose other than to withdraw the right to life from some categories of unborn children. “To do so would radically change the principle, for all unborn children and indeed for all of us, that the right to life is a fundamental human right,” he said. He noted that during the current debate over abortion some had argued that abortion itself is a human right. But that view, he said, was inconsistent with an integral understanding of human rights. “We would point out that the European Convention on Human Rights requires that ‘everyone’s right to life shall be protected by the law’. The UN Convention on the Rights of the Child defines a child as meaning ‘every human being below the age of eighteen years unless, under the law applicable to the child, majority is attained earlier’. No distinction is made between born and unborn children,” Bishop Cullinan said. Speaking about the power of language, Dr Cullinan referred to the use of language in relation to unborn children. “Words like ‘foetus’ and ‘embryo’ and ‘zygote’ have specific technical meanings. We question why, in public discourse, healthy unborn children are always referred to as ‘the baby’ while those who, in the opinion of some, do not measure up to expectations are routinely defined as the ‘foetus’ or the ‘embryo’. We are concerned that language is being used with the intention of depersonalising certain categories of unborn children in a way which seeks to normalise abortion,” he said. He also highlighted that many thousands of Irish people are alive as a direct result of the enactment of the Eighth Amendment, who might otherwise never have been born. Quite apart from the numbers of lives that were saved as a result of Article 40.3.3, expectant parents who experience a crisis pregnancy have been culturally supported in making the decision in favour of life and in avoiding a decision which many of them may have regretted afterwards. The goal of good maternal care would be to achieve a maternal mortality rate of zero. Sadly, Dr Cullinan noted, this is practically impossible because there are some potentially fatal medical conditions related to pregnancy which cannot easily be predicted for individual women. According to the most recent figures, published by the World Health Organisation in 2015, the maternal mortality rate for Ireland is 8 per 100,000 live births. This places Ireland 26 out of 190 countries, and ahead of the United States and the United Kingdom, where abortion is readily available. Clarifying Church teaching on abortion he said the faithful believe that every unborn child, irrespective of his or her medical condition or the circumstances of his or her birth, has the right to be treated equally before the law. He underlined that the Catholic Church has never taught that the life of a child in the womb should be preferred to that of a mother. “By virtue of their common humanity a mother and her unborn baby have an equal right to life,” Bishop Cullinan said. Where a seriously ill pregnant woman needs medical treatment which may, as a secondary effect, put the life of her baby at risk, such treatments are always ethically permissible provided every effort has been made to save the life of both the mother and her baby. Abortion, he emphasised, is the direct and intentional destruction of an unborn baby and is gravely immoral in all circumstances. It is not a medical treatment.